Once upon a time I made an egg white quiche (click here to see it in all it's eggy glory.) Turns out, it's been my most popular post to date--who would have thought it?!? Apparently, people love egg white quiches and there aren't that many recipes for them out there. Now, I am not watching my waist or anything, but I am NOT into waste, either... so when I made tiramisu for Christmas, I had to use a lot of yolks...which meant I had leftover whites. Given the popularity of my original egg white quiche, well, I wanted to give people options. So I made these quiches mini. This was partly because I am obsessed with miniature things. On a more serious note, these are perfect for entertaining, for popping in the fridge and reheating for weekday breakfasts, or for just using up egg whites you have leftover. So here I have rolled out a Jiffy crust. It's my favorite, Jiffy crust. But you can you use any kind of crust that turns you on. Pillsbury. Your own homemade. Whatever! I had every intention of using my biscuit cutters to accompish these crusts. 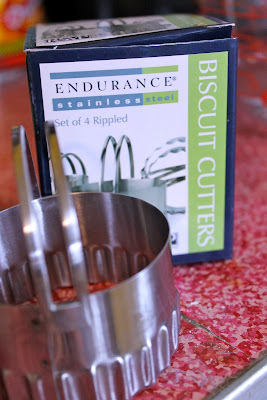 I love my biscuit cutters. They are just so quaint.... what they weren't? So I broke out my mini pie crust cutter (from my mini pie maker set). You can use anything that fits--a knife will do just fine, the top of a glass! I lined my muffin tins with liners because, frankly, when I don't do this, it always turns out to be a frustrating mess. Plus, the cups make for easy storage and I like that. Then, of course, I lined my cups with my dough cut outs. Let the filling begin. And let's be clear: this is supposed to be fun! The point of making these minis is to be able to have a variety of fillings. Life is too uniform--shake it up with some variety in your quiches, at least! I did put cheese in all of them, though. And since they are so tiny, well, you don't need to overload them. To some I added mushrooms. See??? It's fun. And it's easy. Part of the great thing about these quiches is you use what you have on hand. So if you have lunch meat, use that. Leftover chicken? Sure! Shredded carrots? Alrighty! Whatever you have and like can go in these suckers. Then it's time to add the eggs. You want to use 8 egg whites and 1/2 cup of milk. By the way, this recipe makes 11 little quiches. I know it's a weird number, and I was totally going for 12, but sometimes you don't get exactly what you bargained for... que sera! I put my eggs and milk in a pourable measurer because it made distribution into my crusts easier. So I poured my eggs in and then I gave them a little "jiggle" with a fork to ensure the filling was distributed evenly. It's a proud moment, no? As for the leftovers? They store nicely and reheat for 30 seconds in the microwave, which really makes my morning easy. filling for your quiches (and these are merely suggestions): lunch meat, shredded carrots, arugula, mushrooms, cheese, and diced onions. 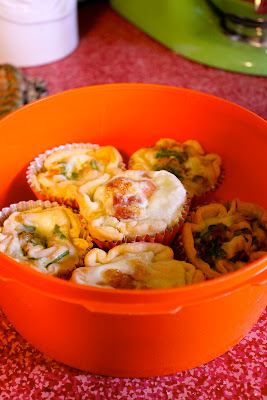 Line muffin tins with muffin liners (if using). Using a mini pie cutter or other tool, cut out your crust to fit your muffin cups. 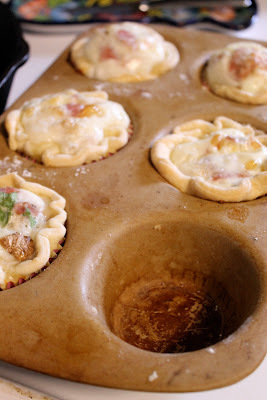 Line the muffin cups with the crust. Next you are going to put your fillings in your crusts--this is the fun and creative part. Sprinkle in a little shredded cheese, salami, pepperoni, turkey, arugula, and/or mushrooms and diced onions. The only thing you want to be careful of is not to fill it too much because you will need a little room for your egg whites. In a pourable measuring cup, add your 8 egg whites and your milk. Beat with a fork to combine. 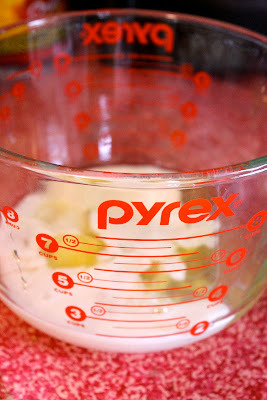 Carefully pour the egg white mixture into your individual crusts, distributing evenly. Using a fork, give your little quiches a quick "beat" to ensure that the filling is even in the crust. Bake the mini quiches in your preheated oven for 30-35 minutes or until the egg is set and the crust is goldeny.